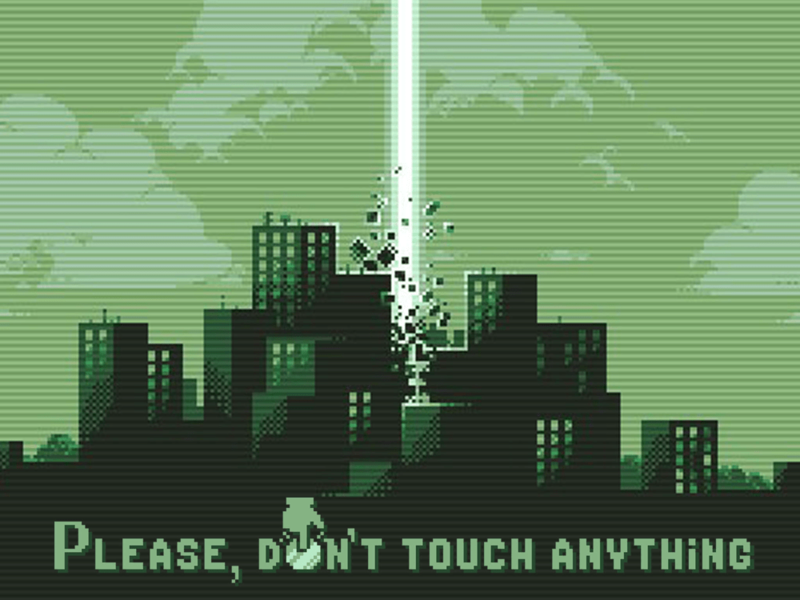 Bulkypix’s Please, Don’t Touch Anything (PDTA) was first available on PC, but I hadn’t heard of it until I saw the trailer for the upcoming iOS version. The game looked quirky and weird and right up my alley, so I was excited to play when it finally arrived on iOS. 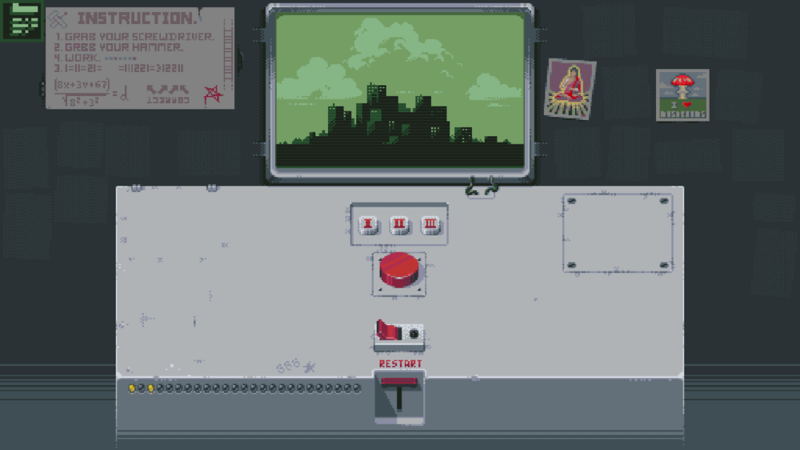 PDTA starts with you in front of a pixelated Game Boy-like screen with a console beneath it and one giant red button. The security guard who normally watches the screen asks you to take over for him while he runs to the bathroom. Before he goes, though, he tells you not to touch anything. Obviously, that wouldn’t make for a very interesting game, so you will touch things. At first, you’ll discover new switches and tools just by tapping the big red button a few times. But randomly tapping things can only get you so far. If you want to see all twenty-five endings to the game, you’ll have to be clever and decipher all the clues hidden in plain sight. There are many different number codes, color codes and other useful bits of information to find. But the game likes to be cryptic and doesn’t hold your hand. You need to think outside the box. Many of the buttons and switches you find will have more than one use. But clues usually have one meaning and can then be ignored. It’s a bit like a room escape game, but you’re staring at the same wall the whole time. The wall does change, though, with each new ending you find. Besides a little light lighting up to show your progress, a poster or badge will appear somewhere on the wall that represents that specific ending. Sometimes those are even used as clues themselves. The retro soundtrack is great, and this is coming from someone who doesn’t really have any attachment to old NES or Game Boy soundtracks. But I appreciate the variety and how the music changes depending on the buttons and switches you have out. It keeps things interesting. There’s also a lot of pop fiction references and dark humor in the game and the soundtrack helps support those. I wanted to complete the game myself and I had every intention of doing so. I tried very hard not to cheat, but eventually couldn’t help myself on the last few levels. I cheated a few times just because I got tired of staring at the same clues for hours and not making sense of them. The clues are still logical, but you have to think about them a certain way, and my brain was just not working that way. They all make sense in hindsight, but I’m not sure I would have gotten some of them no matter how long I thought about the clues. Also, there’s a puzzle that asks you to play part of the soundtrack on a three-key piano. Despite my love of music, I’m tone deaf and get very frustrated with puzzles like that. I’m not good at hearing a tune and copying it. So I cheated instead of torturing myself with it. Those who don’t mind those kinds of puzzles might actually enjoy it, though. 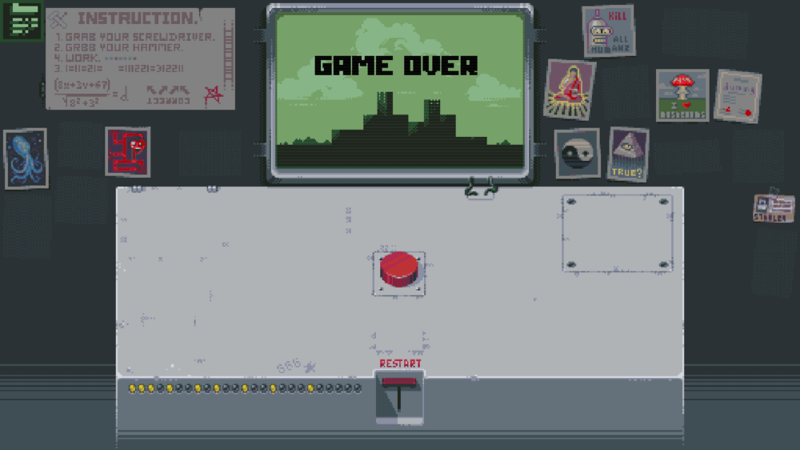 There is also one ending that involves playing an arcade game, and it stressed me out like you wouldn’t believe. I almost gave up on completing the game because it was frustrating me so much. The rest of the endings were relaxed, so this felt very out of place. Had the arcade game been a separate app outside of this one, I would have gladly deleted it after a few failures. And if I didn’t finally beat it when I did, I probably would have had to accept defeat and move on. You might even say it left me with some PDTA PTSD (sorry, I had to do it). There’s even a GameCenter achievement for that level if you complete it without a single mistake, but I think it’s safe to say I won’t be trying for that. Since this review is for the iOS version of the game, let me discuss its performance a bit. 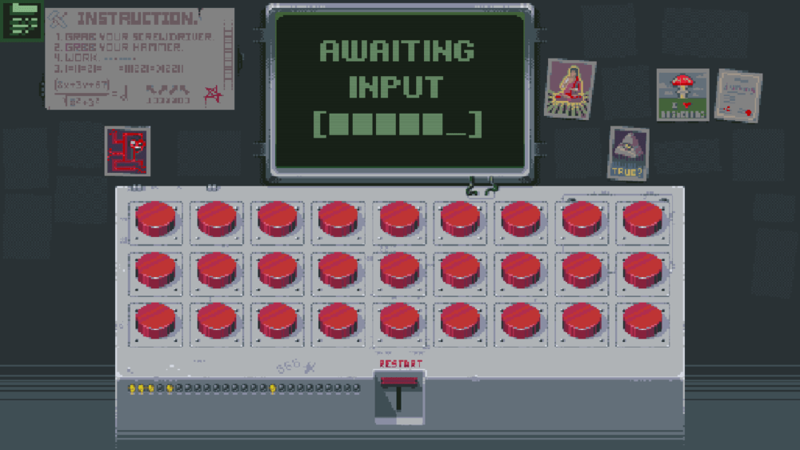 Touch screens are obviously a great fit for a game that’s about pressing buttons. It certainly seems more natural to do so with your thumb than with a mouse. I also love the intimate feeling of having the game in my lap. It is a bit tight on my iPhone 6S, but the developers added pinch to zoom, which often helps. Sometimes, though, it’s not enough. There are parts of the game with very small buttons and sometimes I hit the wrong ones or they weren’t as responsive as I’d like them to be, even on my bigger iPad Air 2. But for the most part, the game plays well and I didn’t encounter any major bugs. I should also mention that three new endings were added with the release of the iOS version, which I think is a really cool thing to do when an older game is released on a new platform. 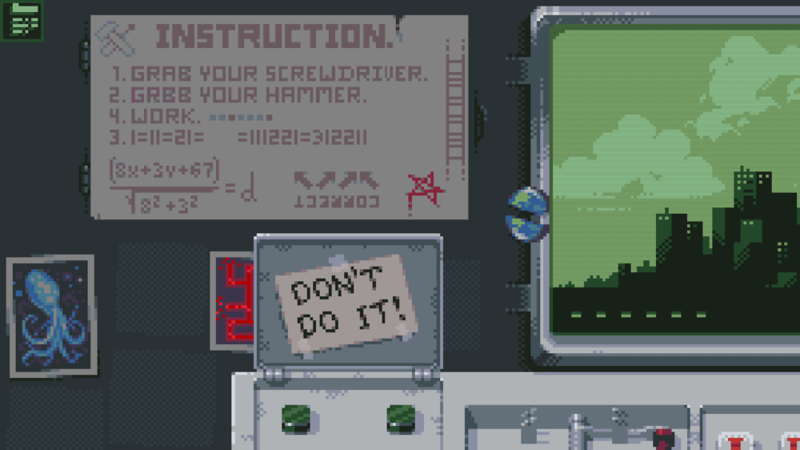 Overall, I’m really glad I had a chance to play Please, Don’t Touch Anything. It’s a great fit for touch screens and I appreciate the developer’s efforts to bring it to mobile, including iPhones. I would recommend it to anyone who likes quirky, brainy games and doesn’t mind a bit of frustration. Your level of enjoyment of PDTA will likely depend on how good you are at deciphering the clues in front of you. It’s a thousand times more satisfying to discover an ending on your own without cheating. If it sounds like something you’d enjoy, you can download the game here. 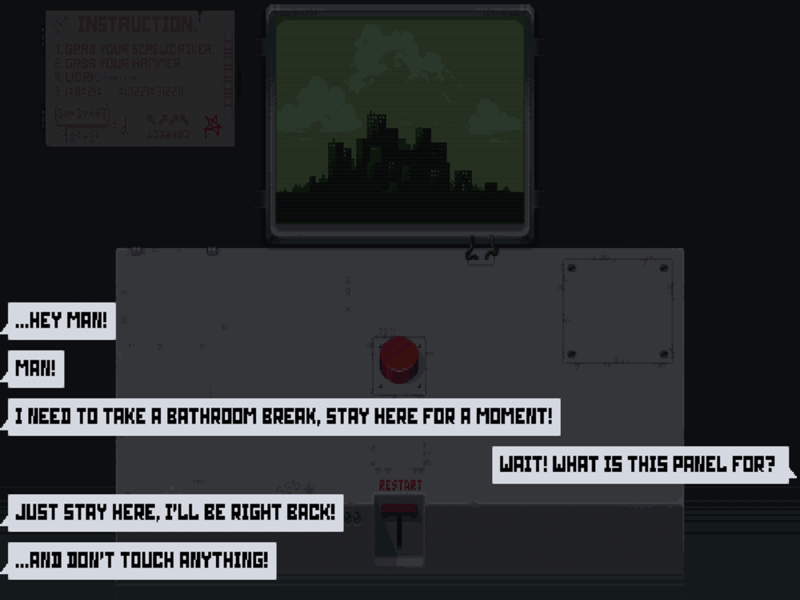 And if you need help finding the new iOS endings, you can try my walkthrough guide here.